Hortus Camdenensis | Prunus tenella Batsch. 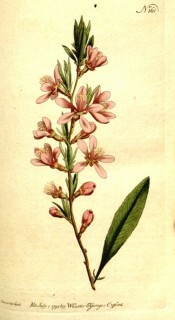 Fully-hardy, bushy, deciduous shrub with upright shoots and bowl-shaped, bright pink flowers, solitary or in profuse clusters of 2-3, produced with the leaves in spring, followed by almond-like fruit. To 1.5m. [RHSE, Hilliers']. ‘This pleasing shrub has long been cultivated in this country: it is a native of Persia; and, if the weather is not very severe, usually flowers early in the month of April. It grows about two or three feet and sends out many suckers from the root.’ [LBC no.1114, 1827]. ‘The Dwarf Almond, a native of Russia and Tartary, is justly considered as one of our most ornamental shrubs; it rarely rises above the height of three feet, and hence becomes very suitable for the shrubbery of small extent. It flowers about the middle of April, somewhat later than the common Almond. Miller observes, that the roots are apt to put out suckers, by which the plant may be increased in plenty; and if those are not annually taken away, they will starve the old plant. Cultivated in 1683, by Mr. James Sutherland.’ [BM t.161/1791]. Listed in the 1845, 1850 and 1857 catalogues [T.52/1845]. A plant was presented to the Sydney Botanic Garden by William Macarthur on September 15th 1847 [RBGS AB]. More details about Prunus tenella Batsch.